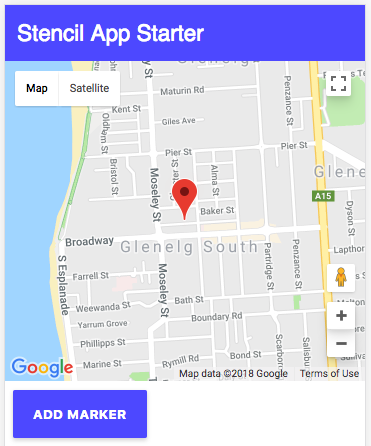 Last week, we created a custom Google Maps component for an Ionic/Angular application. Since I have also been creating a lot of Stencil content recently, I think it is fun to see how we could build the same components that we build for Ionic/Angular, except as a generic web component with Stencil. To that end, in this tutorial, we will be recreating the same Google Maps component in Stencil. The main benefit to building a component as a web component with Stencil is that it doesn’t depend on a particular framework (Angular in this case), but that can also be a downside because you miss out on the features of that framework. This tutorial isn’t going to focus too much on a comparison between the two approaches, I just want to point out that it isn’t a case of one approach inherently being better than the other. The main point of this tutorial is to cover how you would convert one particular custom Angular component to a Stencil component. As you will see, the bulk of the code actually remains the same (since most of it is just normal TypeScript), we just need to change a few Angular specific things. Just like in the previous tutorial, we will be using Capacitor so that we can make use of the Geolocation and Network APIs. With the set up out of the way, let’s get into creating the component. Like last time, I will just paste all of the code at once and then we will talk through the changes. If you’ve read the previous tutorial, then you will likely notice that the structure of this component is very similar to the Angular version, almost identical infact. However, there are some key differences (aside from the general syntax changes). Previously, we just attached the Google Map to the host element of the component, but if we attempt to instantiate a new Google Map on the host element of this web component we will get some undesired behaviour. Instead, we set up this child element to attach the map to instead. and we also do the same for when we are creating the Google Map.The settings for the TypeScript compiler are more strict in this project, so we have also had to remove some unused parameters. This allows us to expose two public API methods on the web component. This will allow us to call the addMarker method to add a marker to the map, and we can also grab the current center position of the map with getCenter. We are also going to need to add a couple of styles to the component to make sure that it expands to fill the size of its container. Now that we have our component created, we just need to use it. We are just going to add it to the app-home component that comes with the starter project. In order for the map to display properly, we are also going to have to make a couple of style changes to the home component. The number of changes required to convert this Angular component into a web component built with Stencil was very small. Although there are obvious syntax differences between Angular and Stencil, both are predominantly just TypeScript, and most of the Angular specific stuff can be reasonably easily converted. So, in most cases, you will likely find it similarly straightforward to convert Angular components to Stencil components or vice versa.